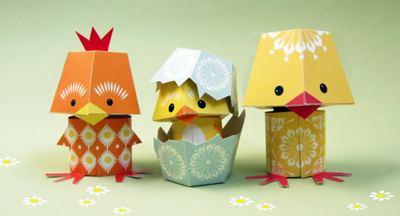 These happy spring papercraft characters look like a fun project to do with the kiddies. (Well, I have no kiddies, so I don't know how old you have to be to make these. I think an advanced 18-month-old could probably pull it off.) Templates and instructions are available for $4 from Mibo right here. Well, if my 10 yr old drama queen is any guage, I'd say 11+! I got her to try out the olympic mascot paper dolls and it ended in much frustration and many tears...and scotch tape! Those are darling! My daughter loves crafts! LOVE the rooster! Too cute! These are the cutest & most mid cent Easter decs I've seen. I'll give them a try this week. I don't have kids either, but I still make time for craft nights with my older sister (at age 22 and 25!) It's always such a blast, these look right up our alley! Well, I have a pile of kids, and I'll say from experience that 18 month olds are lucky to get a spoon in their mouths w/o missing! Forget cutting, gluing, lining up edges, etc. Even 5 might be tough - I'd think 6 on, maybe. But I will tell you that 18 month old is going to love playing with for sure! These are super cute, thanks for the link! Okay. I'll post an embroidery project for the 18-month-olds, then. Wood burning might be good, too. How about carving with chain saws? I think I saw that on my second grader's list of things to do. I love love your blog. Oh MY those are so stink'n cute! Thanks for the link! Hi! Your blog is fantastic, so much inspiration! I have totally "snowed into" (as we say in swedish) cut and fold papercraft. Love your links. Love, love, love these. So spring. So cute. Ordered these and made some for the women's retreat at church. Thanks for the idea, Jess. Ha! Too cute! The paper adds great character, too! oh wow this is too adorable! I love Easter!